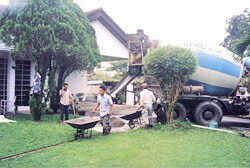 Initially the concrete mixer waited on site, whilst delivering the mix via relays of wheel barrows, but later dumped the load onto the drive way. The mix was excellent and stiff enough to make hand balls, so did not make to much mess. When poured, required poundings to lay flat. The mixer was dispatched after only one delivery, the remaining half was mixed by hand. The contractor may have assumed it was cheaper that way. Mixing about 4 cubic meters requires a lot of manpower with many trips to the local sand and cement market. 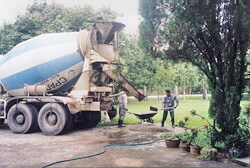 This shows the mixer in the front drive way and two of the four wheel barrow men moving the concrete. The dark line is an iron channel for the barrows wheel, stretching all way around the house.